“Don’t touch that, that’s Mine”, he said politely but really meant it. Embarrassed, taken aback, pissed and several other stages in between, led to the stage of annoyance for her. “It’s a friggin’ masala papad!”. “Could be, but that’s MY masala papad. I asked you to call for yours, didn’t I?”. She didn’t know what to say, but she knew she would stick to ‘not saying anything’ for a long time to come. She just smiled and said “Whatever”, trying to show she was OK with that brand of sense of humor. She was not. Things were moving at just the right pace – neither too quick, nor too slow. They had first met at a common friends’ party and it was dislike at first, second, and the next 350 sights that same evening. He was weird, she was weird AND with tattoos. I mean who gets those many tattoos?? As a matter of quirk though, they still added each other on Facebook messenger. She didn’t ask for his number, he didn’t either, but I don’t clearly remember whose idea it was to add the other on messenger. Either way, that wasn’t the only witty idea they came up with. But that, in a bit. They kept in touch and had a chat on and off. She’d come back from work and chat with him during her commute back home time. Mumbai has a lot of traffic and the train is probably the fastest way to commute. The journey can, however, get very lonely because you are really alone among so many faces, and travelling alone, and like everyone looks alone, yeah you get the gist of what I’m trying to say here? He pinged her when he was having coffee. Maybe he wanted to irk her more than want her number. What did that ridiculous logo on her neck mean? Oh Yeah, she said it was a tribal “element” (lol) for hatred, or freedom, may be peace… err … happiness, something something! But on the neck? He tried really hard not to eye roll himself to another dimension thinking about that, but well, there were a lot of other things he was thinking. He kept thinking about wanting to have some coffee with her. Another anonymous witty idea they had, was to meet for coffee. He asked her because, well, tattoo interpretation was key to survival. They met for coffee, planning to do a Koffee with Karan, and ended up for a Rum and Coke with Tattoos kinda thing. 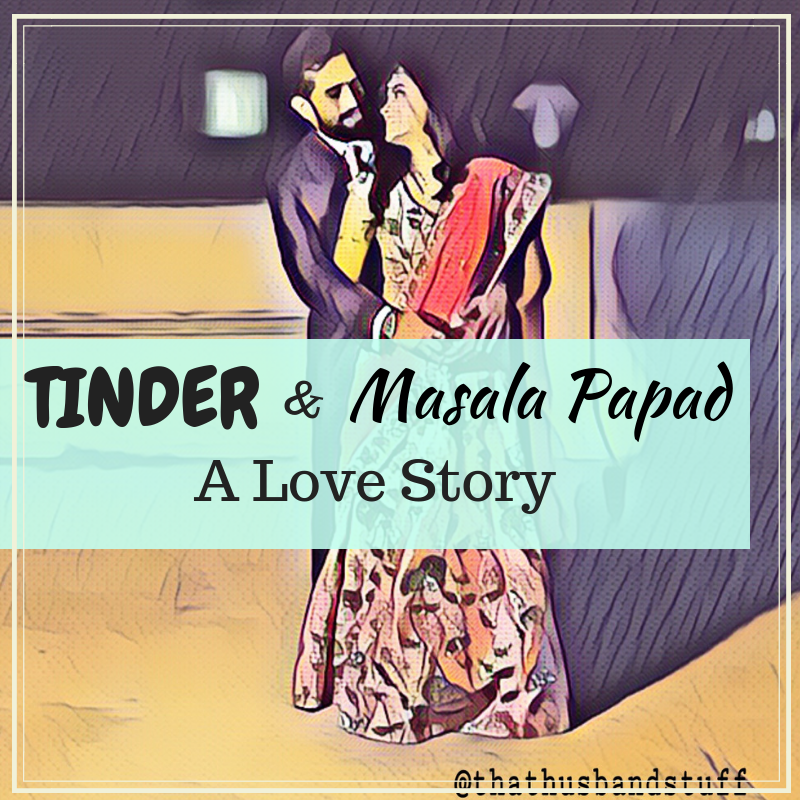 After the Masala Papad event, she asked him to drop her to the nearest railway station. It was at walking distance. But he refused. HE REFUSED! Little did he know what dropping a girl means. It means those extra two minutes of talk, that sometimes mean a hell lot to us. But lets use a cliche’ to define this better – Boys will be boys. So, she went back home and told herself, this was ridiculous. This matchmaking thing isn’t really working out. And even though he is cute just sometimes, this wasn’t what she’d expected. I mean Masala Papad? How can you not share a Masala Papad? Many more days passed, and life moved as mundanely as it could. Everything was routine, and hours just kept changing. In the train, amidst the crowd, she was swiping on Tinder. Like, you know, what the hell! Suddenly, she saw his profile. And she swiped right, you know, JLT? and a genie summoned with the message “It’s a Match!” .It was almost like the sleepy aunty next to her could see the genie cockeyed! A chill went down her spine and her hands kind of got cold and sweaty. ‘That’s weird’ she smiled and said to herself. When he saw the notification, he already knew she must be in the train, on her way home. So, he knew he could now ask her for her number and finally talk to her. Meetings, Coffees, Rum and Coke, everything happened. I won’t bore you with their La La La La songs in Gardens of Mumbai, and them holding hands in the locals, or them talking to each other, smiling sheepishly, during the work hours of Batman. But what I can tell you is that they decided that maybe it’s time to involve the parents. Remember, I told you? Witty, Genius Ideas? Well, this is going to bowl you over! So this smart duo, just like every other smart duo in love, was apprehensive of how their parents would react to find out about them choosing a partner for themselves. Maybe the parents still preferred the arranged marriage deal over a love marriage, and what if that was true?! So, they decided to use the profiles which their respective parents had created on SHAADI.COM and exchanged their profile details. So we all know shaadi.com right? It is just like tinder, just more parent approved and for sanskari youngsters! One fine morning, while the family was having tea, and chitchatting, our dude was busy with something on his phone (He couldn’t seem unusually nice, y’know!). He shared something he found on shaadi.com, with his mother. “Mumma, I kinda like this girl. Why don’t you send an inquiry? The site has their details. Should I ping them?”. His mother, teared up, almost dropped her empty cup of tea, and was about to Hug her son – her lovely, obeying, sanskaari son (Ok, I probably dramatized that a bit much) but despite that flood of happy emotions, that she somehow managed to clutch at that moment, she just gave out a controlled, subdued, one word – “Sure!”. Today that couple is actually reading my story, wondering when did all this dramatization happen. Their story, their dialogues, and exact situations may be a tad bit different than what I wrote here, but the overall story is all theirs! If you ever happen to meet them, just never ask them for some Masala Papad. They won’t give it to you. If you are visiting them, just carry some with you in your tiffin box. Keep the onion and masala separate or your papad will get soggy! Any use, reuse, modification for commercial or personal purposes is prohibited. That is very kind of you to say. I’m just happy I was allowed to tell their tale! Hah, this was a fun read for the day. I know Cupid can strike anytime. That’s a masala read and I enjoyed it thoroughly over a lazy weekend reading. Best part are the images, you have nailed with the caricature combining with the narration. Oh my God, Prisha. It felt as though you narrated this to me while savoring some snacks on the sofa with the TV playing in the background. I mean, ACTUALLY felt that way as I read this beautiful love story of the cute couple. And oh, the dramatisation is what added a dash of zest to this already interesting match made in heaven! I can also relate to them as ours, too, is quite an unusual story & we both share quite a few common denominators. I so love their story. I’m in awe. That is so much of fun. I loved how you have weaved this story. Loved the graphics too. This is narrated so well. Great to know a little more about the mystery couple! And I really want to know now, how many tattoos does she have? waah. my kinda girl!!! I have 5 of them – Target is at least 10 in this lifetime. Hmm….making your love marriage look like an arranged marriage is quirky. Their idea of making their profile on shaadi.com and then liking it is amazing. You made my evening so entertaining with this piece. Its seldom that people get to tead such enjoyable writeup on a blog. Hats off to you Prisha. great write up and interesting too! !I have seen and followed few feeds of them…they are interesting…. I loved reading your masala papad write up.